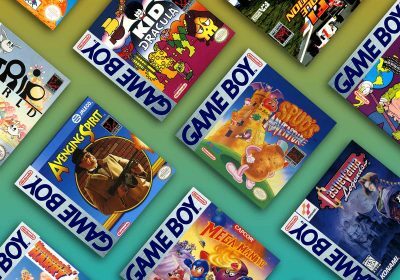 The RetroGaming 101 series is aimed at gamers who are just starting out in the classic gaming scene or are curious about older consoles they don’t yet know much about. Those of you who are especially knowledgeable about the featured console are encouraged to contribute any information that you think would be beneficial in the comments section. If you are new to the featured console and still have questions, you can also use the comments section and I will do my best to help you out. This guide was originally published back in 2007, but it has been expanded and brought up to the standards of our newer guides! Lots of information on the Japanese version of the system has been included, since the TurboGrafx-16 experience benefits greatly from multi-region gaming. Hudson Soft, the company responsible for the creation of the PC Engine (what the TurboGrafx-16 was called in Japan), was founded in 1973, and started out selling, and then later developing for, early computers. The founders were big fans of Hudson-style locomotives and named their company and some of their CPU designs after them. Hudson Soft was the first 3rd party game developer for Nintendo’s Famicom (NES) and over the life of the console they were quite prolific, programming and publishing a number of best-selling titles. Their first Famicom title was a version of their computer game Nuts & Milk. 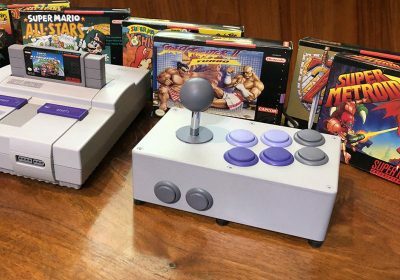 Hudson continued to publish titles on Nintendo systems even as their own PC Engine console was competing directly with the Famicom, and later, the Super Famicom (Super NES). 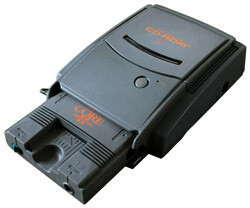 Hudson dabbled in hardware development, a factor which lead to the creation of the PC Engine. 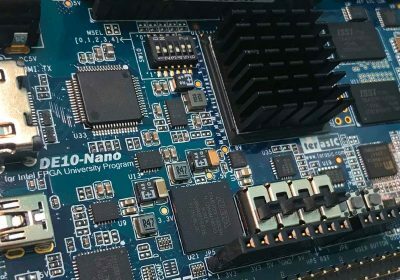 Once they had worked out the core chips that would power their new console system, they partnered with electronics giant NEC to manufacture the hardware. In Japan, NEC and Hudson both visibly backed the system, both with development and marketing. In the US, Hudson stayed out of the spotlight and NEC took full responsibility for the system. First of the 16-bit Era: Hudson designed the PC Engine as a successor to Nintendo’s Famicom. The system uses a custom 8-bit CPU developed from the same CPU family as the Famicom, though much faster and more capable, and with improved audio capabilities. The CPU is paired with a 16-bit graphics chip. Despite the CPU’s 8-bit design, it is just as fast as the CPUs in the Super NES and the Sega Genesis when performing game-relevant operations. Because the PC Engine was the first system of a new generation, it lacks some of the special hardware capabilities of its later competitors, but due to solid design principles and the PC Engine CD ROM² it was able to remain competitive. First CD ROM Console: The PC Engine CD ROM² add-on was the debut of CD ROM discs as a game medium in the home console market. 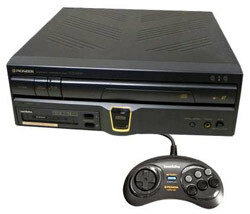 Sega eventually released a CD ROM expansion for the Mega Drive in 1991, several years after the PC Engine CD ROM² had already demonstrated the viability of the technology. Famously, Nintendo partnered with Sony to release a Super Famicom CD ROM drive, only to see that partnership collapse. Sony’s work with Nintendo laid the groundwork for Sony’s own Playstation console. 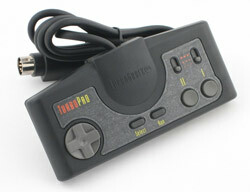 Built-In Turbo Button: All TurboGrafx-16 controllers and all but the first generation of PC Engine pads featured turbo functions for buttons I and II. The basic pad, one of the most comfortable pads made to date, has 2 simple toggles with off, slow, and fast. The TurboStick, a joystick resembling a lighter-weight, rounded-edged, black NES Advantage, featured two sliders for variable turbo and buttons to turn turbo on and off. First Controller Multitap: The PC Engine Multitap was released in 1987 and was the first peripheral of its kind. It allowed up to 5 controllers to be attached to the PC Engine. First Fully-Powered Portable: The Turbo Express, released originally in Japan as the PC Engine GT, was a hand-held version of the TurboGrafx-16. It was not the first portable system on the market. It was, however, the first portable system designed to run the exact same games as the home console. First to Market: In Japan, being first to market for the 16-bit generation meant a sales advantage. The Sega Mega Drive (Sega Genesis) never caught up, and it took Nintendo’s own Super Famicom, the true market successor to the Famicom, to knock the PC Engine into 2nd place. The success and longevity of the PC Engine in the Japanese market is analogous to the Sega Genesis’s success in the US market. CD ROM Technology (Japan): The PC Engine CD ROM² allows the PC Engine to do a lot of things that were only seen on PC games at the time, like full-screen stills and cinemas. It also brought Red Book audio to console gaming, which meant excellent soundtracks and voice acting. 2D Shooter Library: In both Japan and the US, the PC Engine/TurboGrafx-16 was the console to own for fans of shooters. It wouldn’t be until the Sega Saturn was released that players had so many impressive shooter options to test their mettle. 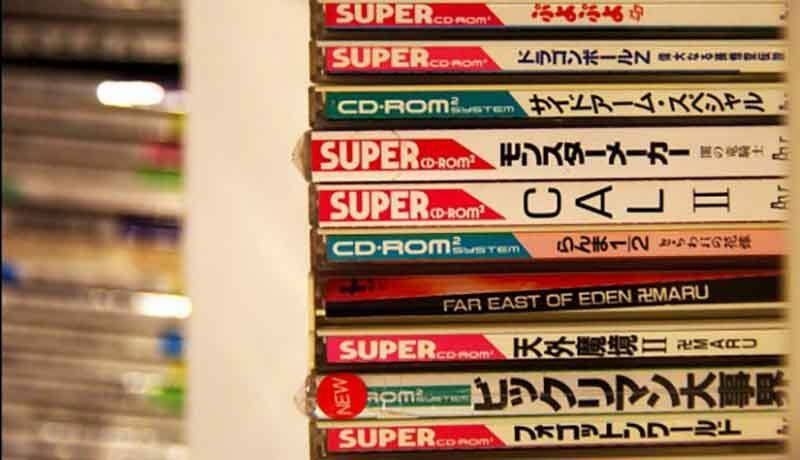 Upgradeable CD Add-On: The Super System Card (release in Japan and the US) and the Arcade Card (released only in Japan) provide more memory to the CD ROM² base unit so that more data can be loaded from CD at once. This means levels can be longer, feature more varied graphics and improved animation, and have more sound effects. The practical effect of these upgrades was that the quality of CD ROM titles improved greatly over the years. Though the Arcade Card was released late in the system’s life, it allowed the PC Engine to host the best 16-bit ports of a number of Neo Geo fighting games. 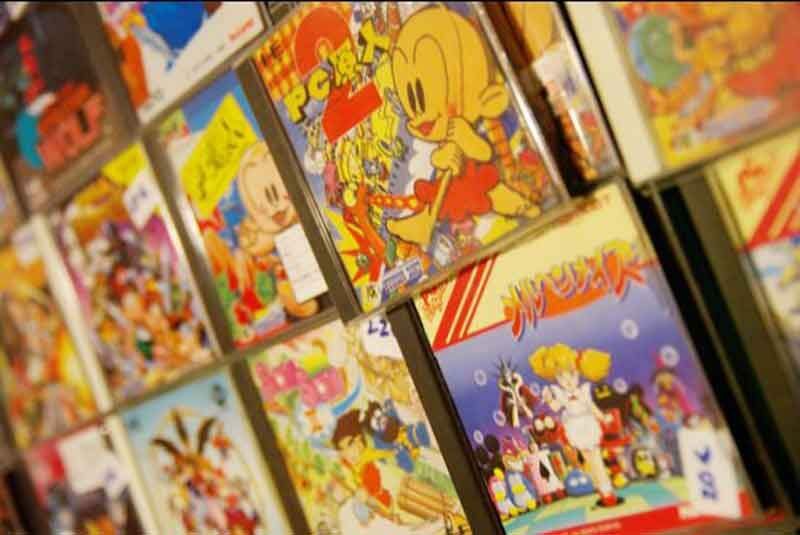 Hudson Soft: Though many other developers created great games for the PC Engine and TurboGrafx-16, Hudson was the most prolific developer, and that wasn’t a bad thing. Hudson’s games were usually excellent. Balanced Design: Though the PC Engine lacks some advanced features like hardware scaling and rotation and a second background layer, the hardware is robust and well-balanced. It has good sprite handling capabilities, excellent color display abilities, an audio chip with flexibility and good digital sample playback, and a CPU that is capable of coordinating the system’s various functions with power to spare. See the Technical Specifications section for more detail. First to Market: Being first to market meant giving competitors a technology target. The TurboGrafx-16 has often been criticized for lacking hardware support for a second background layer, and for including the audio functions in the CPU instead of giving them their own dedicated silicon. What was an advantage in Japan was a disadvantage in the US. CD ROM Migration: Due to the high price of the TurboGrafx-CD in the US, and the fact that CDs hadn’t yet pushed cassettes out of the music market, the expansion was a tough sell for US customers. As CD releases started to supplant cartridge titles in Japan, the US market became a little starved for options. The lack of CD ROM penetration meant CD titles were slower in coming, and the decline of cart-based development on the system made it difficult to sustain the more affordable base unit. 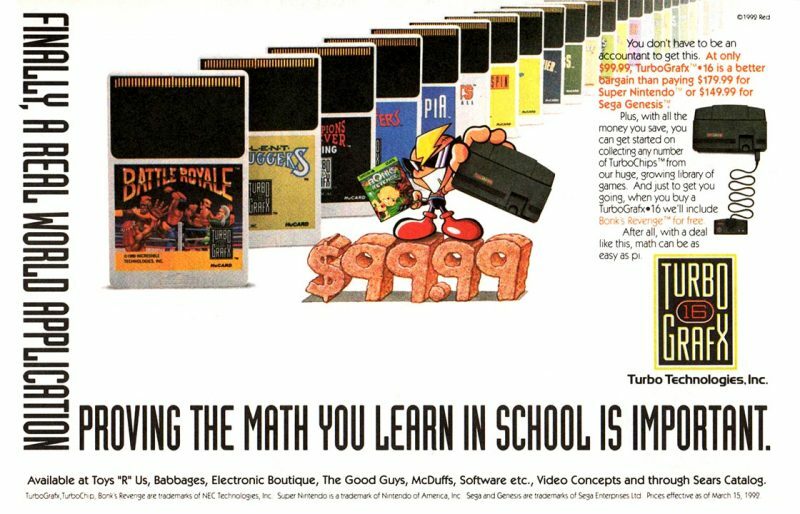 High Hardware Prices (US): The TurboGrafx-16 was initially expensive in the US, and the TurboGrafx-CD attachment and Turbo Express were even more so. The TurboGrafx-CD expansion debuted at $399, which was rather pricey for a peripheral. When the Turbo Duo was finally released it cost $299, which was quite reasonable for all the system could do and for the pack-ins included with it. Unfortunately, the TurboGrafx-16’s market share had fallen far enough that it was difficult to convince US consumers to give $300 to the last-place contender instead of Sega or Nintendo. Virtually Required Add-ons (US): The TurboGrafx-16 had a large number of peripherals, and, depending on the way you preferred to play, they were often required purchases. The system shipped with 1 controller port and only RF out, and not one TurboChip game had a save battery in it. You had to buy a TurboTap to play with even 2 players and if you wanted stereo AV out you had to pony up for, at the very least, a TurboBooster. Some of the best TurboChip games needed save capabilities to avoid dealing with messy passwords, but the cheapest save memory option was the $40 TurboBooster Plus. Later revisions of the PC Engine system added AV capabilities, but the TurboGrafx-16 system was never revised. Thankfully, the TurboGrafx-CD included AV out and CD and HuCard compatible save memory in addition to allowing you to play CD ROM² games. Punished By Nintendo’s Third Party Rule: Nintendo punished publishers who released titles for competing consoles. This meant early releases were dominated by Hudson and Namco titles, as both companies were too large and too integral to Nintendo’s success to punish. While some original developers flourished on the PC Engine, many companies that made their success on the Famicom and NES either never developed for the PC Engine or came over too late to help the US market regain ground. 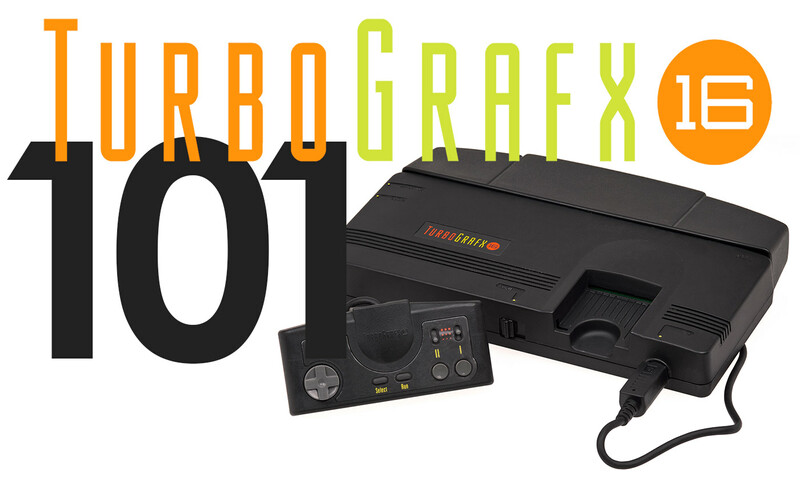 By the time Nintendo was rebuffed in court it was too late for the TurboGrafx-16 in the US. NEC was often criticized for odd decisions about which games to bring to the US, but Nintendo’s anti-competitive practices undoubtedly clouded this issue. 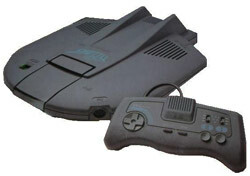 NEC America: NEC America mishandled the nation-wide American debut of the TurboGrafx-16. Marketing was weak outside of large metro areas and the original pack-in, Keith Courage in Alpha Zones, was not the most appropriate pack-in title for the US market. Lack of 3rd Party US Publishers: NEC’s struggles in the US market made other companies reluctant to release titles in the US. NEC America usually dominated release schedules. Working Designs was one of the only licensees to localize more than a couple games in the US, picking up some strong titles NEC America and, later, Turbo Technologies passed over. 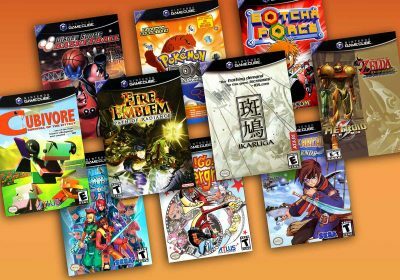 Few RPGs: Japanese gamers didn’t lack for role-playing titles, but not many RPGs were brought to the US, so American RPG lovers were left out in the cold. 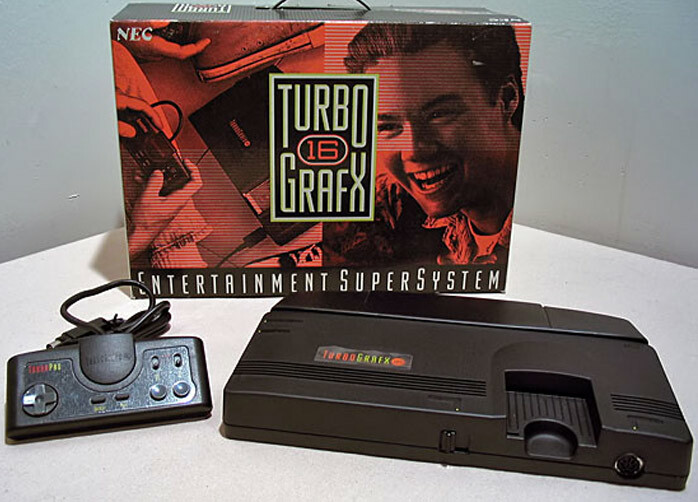 Changing Hands Late in the Game: NEC America handed control of the TurboGrafx-16 over to Turbo Technologies, Inc. (TTI) in 1991. By this point the US market was slipping dangerously. TTI managed to keep games coming until late 1993, and they remained on the market for a while afterwards selling what stock remained, but they never managed to turn things around. Eventually remaining inventory was passed to TurboZone Direct, a small company that persisted for a few years before running out of steam. CPU: HuC6280, custom 8-bit CPU based on the 65C02 running at 7.16 mhz. GPU: HuC6270, handles sprites, background tiles, and all other display effects. Memory: 8 KiB work RAM, 64 KiB VRAM. With PC Engine CD ROM², an additional 64 KiB, 256 KiB, or 2304 KiB work RAM, depending on the system card used, and 64 KiB ADPCM RAM. Sprite Capabilities: Up to 256 sprite pixels per line and up to 64 sprites on-screen at once. Available sprite sizes are 16×16, 16×32, 16×64, 32×16, 32×32, 32×64. Sprites of any available size can be mixed on-screen, unlike some other systems which limited developers to only two sprite sizes at a time. Color Capabilities: System palette of 512 colors. Up to 16 sprite and 16 tile palettes can be used simultaneously. Each palette has 16 colors available, though one color must be shared across all palettes of the same type as transparent. Maximum on-screen colors is approximately 480 (video mode trickery can be used to display more). Audio capabilities: 6-channel PSG stereo audio driven by the CPU. Each channel can generate a programmable waveform or play back low quality digital samples. Two channels can be paired for medium quality digital sample playback (8-bit to 10-bit). Channels 1 & 2 can be paired for LFO (low-frequency oscillation) and channels 5 & 6 can produce white noise. 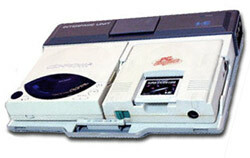 The PC Engine CD ROM² unit is able to play back CD-quality Red Book audio and also added a single ADPCM channel for medium quality digital audio playback. A CD title can therefore provide a total of 8 audio channels of different types, or, thanks to a Red Book audio soundtrack, take less of a hit from pairing PSG channels to take advantage of the more advanced audio features available. 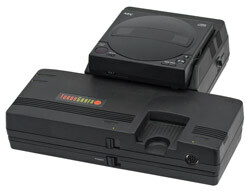 For its US release, the TurboGrafx-16 was doubled in size over its Japanese counterpart, possibly following the theory that Americans think bigger is better, and aided and abetted by some extra RF shielding required by the FCC. The TurboGrafx-16 features RF out only and a single controller port that uses a much larger controller connector than the Japanese PC-Engine. It also has an enormous expansion port that juts from the back of the unit and shipped with a plastic cover that attached over this and made the shape of the system more uniform. The expansion port is identical to the PC Engine’s expansion port and the TurboGrafx-16 can use all Japanese add-ons, and vice versa, assuming the add-ons can fit to the shape of the case. Despite the console’s size, the black case design was pretty impressive-looking. 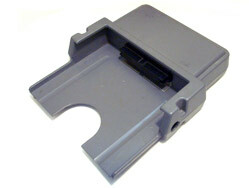 This monstrous peripheral attaches to the expansion port and features a platform on which the TurboGrafx-16 rests. It is effectively the Japanese CD ROM² add-on with a different shape and name. It allows the TurboGrafx-16 to play CD games and features 64 KiB of RAM into which to load game data and an ADPCM chip that provides an extra digital audio channel. It changed the face of gaming by allowing games to feature Red Book audio for spoken dialogue and soundtracks. It also increases the amount of game data that can be stored, meaning that a game can feature lots of cinema intermissions, both still and animated. The only drawback to this is that the limited data cache means lots of loading times between level sections or intermissions.The TurboGrafx-CD containes a removable CD drive slightly larger than early portable CD players. 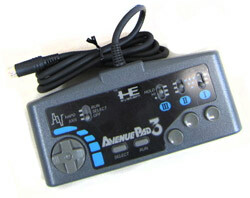 The AC adapter that came with the CD attachment powers both the TurboGrafx-CD and the TurboGrafx-16. 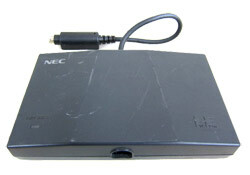 The AC adapter that normally powers the TurboGrafx-16 can then be used to power the removable CD unit when detached and allow it to serve as a semi-portable CD player. It shipped with the CD ROM² System 2.0 card. The TurboGrafx-CD features AV stereo output and save memory for CD and TurboChip games. 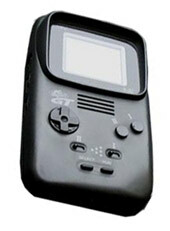 The Turbo Express is a handheld version of the TurboGrafx-16. 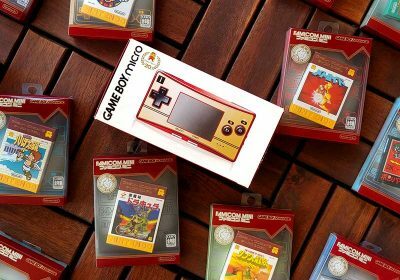 Unlike the Gameboy or the Game Gear it accepts the same cart-based games as the console system and displays them on a small, high-quality LCD screen. Like many early LCD screens it suffers from “ghosting” due to a slow refresh rate, but the screen is one of the better quality ones available at the time. Being a full member of the Turbo family, it includes turbo switches, to this day a unique feature in a handheld.The Turbo Express features the ability to link to another unit for two-player action on select games, and it also features a TV tuner add-on. Due to the quality of the screen, it was almost as good as dedicated portable TV models and wasn’t much larger. The Turbo Express’s primary flaws were the price and the rather short battery life, flaws that were not easily remedied given the technology of the time. Not until the Sega Nomad would anybody again attempt to put a full-powered console into a portable case. Notably, the Nomad, too, was a market failure. The Turbo Duo was the last hurrah in the US. Designed in Japan and barely modified for the US, this system combines the TurboGrafx-16, CD ROM² drive, Super System 3.0 BIOS, and Super CD expanded memory (see the Japan section) into a single, sleek, compact console. It still has only one controller port, but uses the smaller Japanese controller connection. It debuted in the US at $299 and featured an impressive set of pack-in games. The system came with an Ys I & II CD, Ninja Spirit on TurboChip, and a Super CD with Gates of Thunder, Bonk’s Adventure, Bonk’s Revenge, and a hidden copy of Bomberman that was unlockable with a code. There were some packages that featured a different TurboChip game. 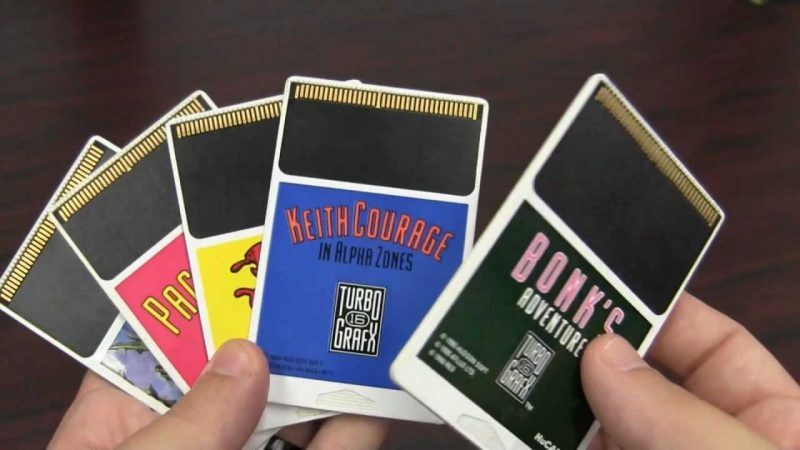 When the Turbo Duo was released the remaining inventory of the TurboGrafx-CD add-on had its price slashed, and as an effort to let others in on the game TTI also released a US version of the Super System 3.0 Card, allowing the TurboGrafx-16 with TurboGrafx-CD to play Super CD ROM² games. The Super System 3.0 Card shipped with the 4-in-1 SuperCD that was also packaged with the Duo, meaning you were never without at least 4 great games to play. The 4-in-1 SuperCD was one of the best deals on the market at the time: two great platformers, a fun puzzle/party game, and one of the best shooters ever. The Pioneer LaserActive is an odd beast, and is quite rare and expensive. 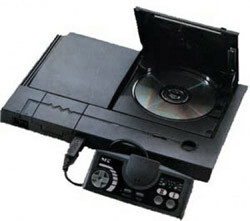 It is a Laser Disc player that features an expansion port on the front. There are three modules, called PACs, that were made for use with the LaserActive player: a karaoke PAC, a Sega Genesis PAC, and a TurboGrafx-16 PAC. The TurboGrafx-16 module features a TurboChip slot and a PC Engine-style controller port. With this module attached, the LaserActive can play TurboChip games, CD ROM² games, Super CD ROM² games, and, with an Arcade Card, Arcade CD ROM² games. There are also a few LD-ROM games that require the TurboGrafx-16 PAC. These titles typically play video from the Laser Disc and use the TurboGrafx-16 hardware to generate an overlay. 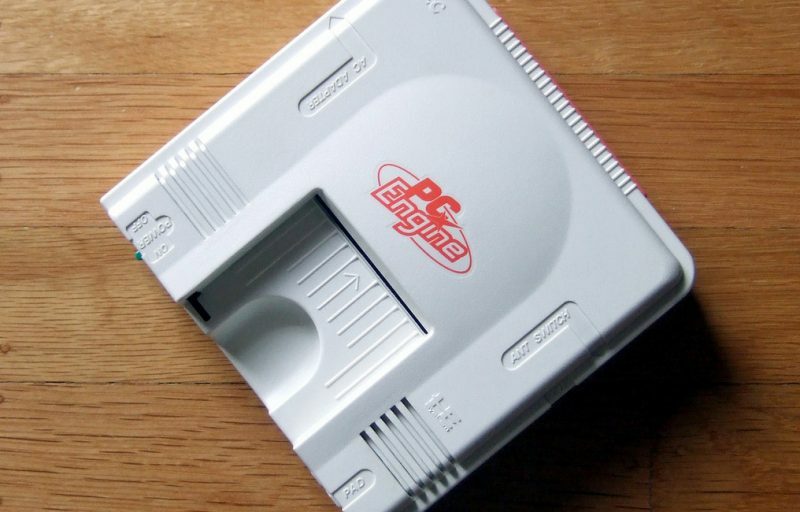 Tiny, white, and square is the first release of the PC Engine console hardware. It features a single controller port, a large expansion port that fills almost the entire back of the system, and RF out. 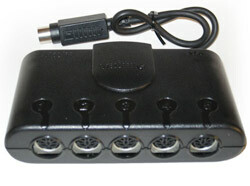 The initial release came with a 2-button pad without turbo switches. The basic shape of the pad is very comfortable and would not be changed until near the end of the system’s life. Pads with turbo switches were included later. This model was probably what was used as the basis for the US TurboGrafx-16 console. The PC Engine CD ROM² add-on (pronounced CD ROM ROM) allows the PC Engine to play CD games. It is white, like the original PC Engine console, and the CD ROM drive itself is removable and identical to the US TurboGrafx-CD drive unit. The Japanese base unit, however, is very different from the US base unit. Whereas the TurboGrafx-CD, when attached to the Turbografx-16, looks like the T-shaped tetrad from Tetris, the PC Engine CD ROM² base unit (called the IFU, for Interface Unit) allows the PC Engine and CD Drive to sit side-by side, much like the second model of the Sega CD paired with a Model 2 Genesis. A cover can be attached and the whole thing can be hauled around like a small briefcase, complete with handle. 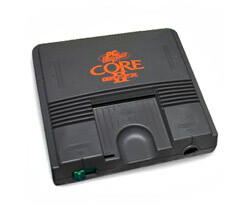 The Core is a redesign of the PC Engine console. It is dark gray, similarly shaped, and includes a DIN 5 plug for AV out (with the appropriate cable) instead of RF out. It also features a CPU revision, the HuC6280a, which purportedly fixes some minor audio issues. Identical to the US Turbo Express other than the logo printing. The Shuttle is basically a PC Engine with a redesigned case, a custom expansion port which lacks CD support, and AV out. It does rather look like a spaceship, making the name quite appropriate. 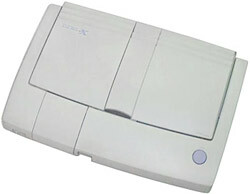 The SuperGrafx is a major revision of the PC Engine base architecture. It features an additional HuC6270 graphics chip with its own 64k of VRAM and bumps the system work RAM from 8KiB to 32KiB. The CPU remains unaltered save that it is the HuC6280a revision also used in the PC Engine Core. Thanks to the added graphics processor and memory, the SuperGrafx can display 2 independent backgrounds and up to 512 sprite pixels on a line, or up to 128 total on-screen sprites, though developers had to be careful to keep the sprites balanced between the two GPUs.The system features the same expansion port as the PC Engine, though due to differences in the shape of the case requires an adapter cable to connect to the PC Engine CD ROM². The SuperGrafx was purportedly created as a response to the Super Famicom, but it didn’t attract much development. It carried a high price tag and only had 7 commercially released games to take advantage of the extra hardware. Fortunately, the SuperGrafx is backwards compatible with all PC Engine games, including CD games. 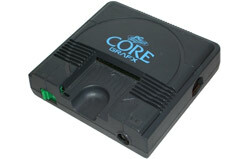 The Core II is a medium gray release probably intended to simplify the system and reduce cost. It uses the original HuC6280 instead of the revised version and features the same DIN 5 AV port as the Core. 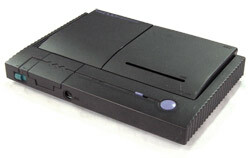 The Super CD ROM² pairs the classic CD drive unit with a revised base unit that extends out behind the PC Engine instead of beside it. It is the same gray color as the Core II. 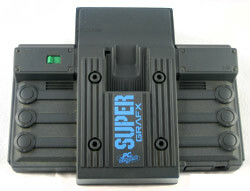 It was designed to be connected to the SuperGrafx without an adapter. These changes are all largely cosmetic. The most important improvements are under the hood. The Super CD ROM² features an updated BIOS (revision 3.0) and increases data storage from 64 KiB to 256 KiB. This allows CD games to cache more data from CD, meaning longer levels with more graphics and program data. During the 16-bit era it was very common for game publishers to put how big their game was in megabits (actually mebibits, or Mib) on the outside of the box. 256 KiB is 2 Mib. Some early PC Engine games are only 1 Mib. This means that the graphics and program data for a single level or area can be up to twice the size of some early game releases. 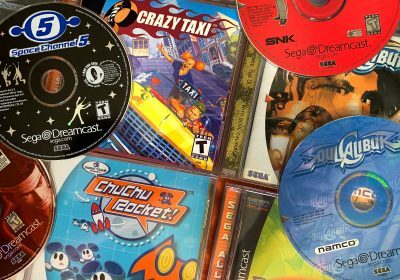 Most of the best CD games on the system came out during the SuperCD era. One of the most sought-out models by collectors, this unit pairs a PC Engine bottom with integrated controls and a hinged LCD screen on top that closes over the system like a clam shell. It doesn’t use batteries but rather relies on a power adapter and therefore must be plugged in. 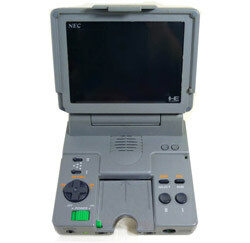 It even has an expansion port and can be connected via a cable to a PC Engine CD ROM² or Super CD ROM² unit to play CD games. Rather than forcing consumers to buy a whole new CD expansion unit to play Super CD games, NEC bundled the 3.0 BIOS and the additional memory required to play Super CD ROM² games into a system card you cam insert into the cartridge slot of your old PC Engine and CD ROM² system. Identical to the US Turbo Duo with a slight change to the case for the region. A new model of the Duo was released with a slightly different shape and white color scheme. Some of the internals were revamped, likely to reduce cost and improve durability. This was the PC Engine’s last gasp to try to preserve market share in the face of the Super Famicom’s late era 16-bit dominance. It upgrades the Super CD ROM² or Duo to 2304 KiB (18 Mib) of cache RAM. The Pro version is for use with the original PC Engine CD ROM² and includes the System 3.0 BIOS, expanded Super CD ROM² memory, and the added Arcade Card memory. There were not many dedicated releases that were Arcade CD ROM² only, but those releases use the extra memory to feature tons of animation and graphical data. One of the most graphically impressive shooters of the 16-bit era and some of the best 16-bit console ports of Neo Geo fighting games are the expansion’s legacy. There are also some Super CD ROM² games that were designed to detect the Arcade Card and use the extra memory for enhanced animation in cinema sequences. This unit looks very similar to the Duo R, but features a 6-button controller that is different in design from the Avenue Pad 6. Games That Defined the TurboGrafx-16 – If you want to check out the games that made the biggest impact on the original TG16 demographic, this guide will take you through the biggest titles. The Cheapest TurboGrafx-16 Games Worth Your Time – If you need a good place to start your collection on a budget, this list should be your first stop. It will cover most of the TG16 essentials. TurboGrafx-16 Games That Pushed The Limits of Graphics & Sound – If you’d like to check out some of the titles that made the most of the NEC hardware, give this guide a look. You might find some interesting technical gems. 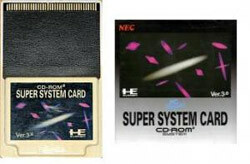 HuCard / TurboChip: This game cartridge form factor is only slightly larger, and about twice as thick, as a credit card. The cases they came in are the same size and shape as a CD case. The HuCards are housed in rubbery plastic sleeves and held in place by a plastic clip or a blob of glue. HuCard/TurboChip games can be stored in their cases in the same CD racks with their CD ROM² brethren. System Cards: The System Cards are HuCards that provide the CD ROM BIOS code, and sometimes cache memory, so that the PC Engine or TurboGrafx-16 can control the PC Engine CD ROM² add-on. There are several system card releases (see Console Hardware and Upgrades). 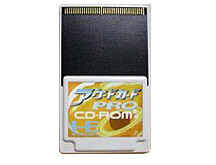 The original PC Engine CD ROM² is not able to play any CD games without a system card in the cartridge slot, and later CD ROM hardware variations required the Arcade Card to play Arcade CD ROM² games. CD ROM², Super CD ROM², and Arcade CD ROM²: I don’t have to tell you what a CD looks like and we’ve covered quite fully what it can do. Suffice it to say, the CD ROM is the PC Engine’s gift to console gaming and probably the most profound legacy of any home console system. The world’s first multi-tap. It is a rectangular block with 5 controller ports and a cable out the other end that connects to the single controller port on the front of the TurboGrafx-16. Unfortunately this device is required for any number of players greater than one, but many TurboGrafx-16 games support 2 or 5 player play so it is a worthwhile investment. Basic system controller. Comfortable gamepad with a responsive rocker pad and 2 action buttons with built-in turbo capabilities. 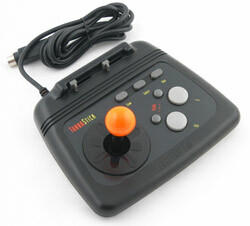 Joystick for the TurboGrafx-16 with variable turbo and a nice, large base and bright orange joystick knob. It is quite durable, too. I used one of these for years and it never even flinched. Comparable in quality and durability to the NES Advantage, though quite a bit lighter. The joystick knobs of the TurboStick and NES Advantage are identical in shape and threading, and I often switched them, creating an all-black TurboStick and a rather unattractive NES Advantage. This add-on plugs into the expansion port and mimicks, in appearance, the plastic dust cover, keeping the TurboGrafx-16′s uniform shape. It adds AV Stereo out. It was originally priced at $30. Nearly identical to the TurboBooster, but with save memory included so you can save your high scores or, in a few cases, your progress, without having to input annoying passwords. Useful for saving games for Dragon’s Curse and the Neutopia games. Attaches to the expansion port on the PC Engine and adds AV ports, just like the TurboBooster, but much smaller, to match the smaller PC Engine’s size. A HuCard with save storage that lets you store or swap your CD ROM² unit’s (or Tennokoe 2’s) save memory to one of 4 storage banks. You cannot store specific save files, only the entire save memory. You can also swap in place, so you can maintain a total of 5 save configurations: 4 on the card and 1 on the CD ROM² unit itself. Attaches to the expansion port on the PC Engine and adds save memory, like the TurboBooster Plus, but smaller and without AV outputs. A special save memory unit that plugs into the controller port and allows a controller to be daisy-chained from it. Support for this peripheral is limited to certain titles and it cannot replace a standard save unit. 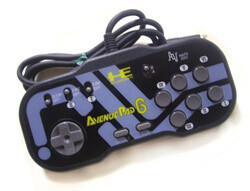 A three button PC Engine pad. It was released to coincide with Forgotten Worlds on Super CD ROM², a game that really needs three action buttons. With a standard, two button pad you have to use Select for one of the functions, which can be cumbersome in play. A few other titles can specifically take advantage of the third button, and when it isn’t explicitly supported it simply mirrors the Select button, which can be useful by itself. An excellent six button pad designed for release at the same time as Street Fighter II’. Some later games also support it, including all the Arcade CD fighting game releases. Definitely bests the comfort and response of the default SNES pad and might even be competition for the Sega Genesis six button pad. 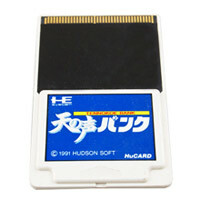 Japanese HuCard games have a different cartridge pin out from US TurboChip games. In order to use Japanese HuCards in a US system you need an adapter or a switchable system mod. To use US TurboChips in a Japanese PC Engine you need more than an adapter. US games do a region check on the system, a check a PC Engine can’t pass. If you have a PC Engine and want to play TurboChip games you have to open the system and cut a particular pin on the CPU. This solution apparently does have a couple rare incompatibilities, so it isn’t perfect. Some people perform mods that allow not only switching the necessary data lines but also disconnecting and reconnecting the critical CPU pin, thus preserving compatibility as well. All CD games lack region protection and will work on US and Japanese systems, provide the proper System Card is available. The CD ROM² System Cards are all region-specific and have the same constraints as HuCard and TurboChip games. There are no US region Arcade Cards, only Super System 3.0 and System 2.0 cards. Japanese controllers use a smaller connector than US TurboGrafx-16 TurboPad controllers. The US Turbo Duo and later TurboPads use the Japanese-style connector. This means that earlier controller peripherals were not compatible with the later Turbo Duo or Japanese units without a converter. TTI tried to remedy this by selling TurboTaps (see Accessories, above) that were modified to connect to the Turbo Duo with the smaller connector but featured 5 old-style ports so you could use old-style controllers. The inverse was available from a few tinkering fans and later from Turbo Zone Direct, the company that took over sales of the remaining inventory from TTI when it finally folded. Emulation Status: Since the last update, the emulation scene is much improved. While most emulators do have some very minor issues, mostly finicky issues with sound or rare controller input delays, they largely look and sound great. Best PC Emulator: This used to be the $20 Magic Engine, but no more. ME is still a great emulator, but it is no longer the best. Many still find it the easiest to use, however. It uses a custom, non-Windows GUI, much like many other emulators that originated at about the same time and earlier. ME’s flaws are minor and include the lack of a modern Windows GUI and a volume balance problem between PSG, Red Book, and ADPCM audio that requires adjustment, something you can do manually within the program. Most Accurate Emulation: Mednafen is the clear winner. Mednafen is a multi-system emulator designed for Windows, Linux, Mac, and a few others. Source code is also available for enterprising types. It is able to tackle almost any PC Engine game thrown at it like a champ. What keeps Mednafen from being perfect? No GUI. There are a couple 3rd party GUI game loaders, but you still have to make most of your configuration changes using hotkeys or in the config file. If you don’t mind the command line, you won’t have a more compatible experience shy of real hardware. Best Windows Emulator: Ootake takes the prize in this category. Though developed in Japan, the menus are all in English, and the accompanying text files have rudimentary English translations as well. It isn’t quite as good as Mednafen for accuracy, but it has a proper Windows interface, is pretty easy to use, has pretty good emulation accuracy, roughly matching Magic Engine, and it’s available for free. Not only that, but it’s constantly being updated, and just in the past couple years has had recording and playback support added to it. Like Mednafen, the source code is available for those who want to play around. Best Emulator for Tool-Assisted Play: If you want to get into creating Tool-Assisted Speedruns, you’ll want BizHawk, the multi-system emulator designed by the TAS Videos community at tasvideos.org. It draws heavily on Mednafen’s code base, though it doesn’t share Mednafen’s accuracy. 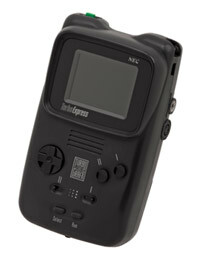 It can be difficult to use at times due to the complexity of some of the functions, and it does have some issues with a few PC Engine games, but you can do some crazy stuff with it, like recording gameplay inputs and playing them back, frame advance, memory viewing, and encoding recordings to AVI. Wii Virtual Console: The Nintendo Wii Virtual Console supports a pretty solid number of TurboGrafx-16 games with it’s specialized emulator, including a few CD and Super CD titles. Emulation quality is generally pretty good. A couple Japanese games are even offered, untranslated of course, including Gradius II and the legendary Dracula X. This is the most affordable legal alternative to buying a physical copy of Dracula X. Games are available for purchase on an individual basis and are relatively affordable. MindRec: A programming and web development company that does PC Engine development on the side, if only because BT Garner of TurboList fame is the man in charge. They were the first on the commercial homebrew scene for the PC Engine and have been dormant for some time, but with the reprint of Meteor Blaster DX there are indications that change is coming. Implode: A colored block puzzler with explosives. Included on the CD are Crash and Humpball as well, a couple bonuses that will hopefully not keep you from the main attraction. Meteor Blaster DX: A souped-up Asteroids clone. Recently reprinted on proper pressed CDs (no more CDRs). Includes a Caravan mode and the puzzle game Loop as extras. Aetherbyte: A veteran programmer, a talented newcomer, and an amazing artist have created what seems to be a classic arcade revival on the TurboGrafx-16. One of their hallmarks is insisting on using chiptunes soundtracks despite making CD games (which typically feature Red Book audio soundtracks). Once you hear their chiptune work, however, you’ll agree that this isn’t necessarily a bad thing. Insanity: A colorful Berzerk port with a dark, droning, retro-techno soundtrack. Has an Xbox360 release as well. Pyramid Plunder: A Pac-Man clone that mixes things up with powerups, multi-screen levels, and level and enemy graphics that change as you advance through the game. Frozen Utopia: Several creative individuals from the PC Engine community who are, together, a powerful force for gaming. Mysterious Song: A port of a DOS RPG with redone content. Has cut scenes and voice acting as well as a suitable CD soundtrack. It is a little on the short side but hews closely to classic RPG sensibilities. You’ll feel just like it’s 1990! Touko: A mysterious Frenchman with amazing PC Engine powers. He only has one complete commercial title so far, but it won’t be his last. Like Aytherbyte he’s sticking closely to the arcade classics that the PC Engine and TurboGrafx-16 missed out on back in the day. Revival Chase: A remake of the classic arcade game Lock n’ Chase. Exclusively available with the classic games magazine Revival, which, fortunately, has a US version. The US issue this title is paired with is 45. Here is a link to help you procure this one. Includes a hidden shooter. Some great homebrew hardware is also available, for those who want to play homebrew ROMs, translated ROMs, and ROM hacks. Low Cost Flash HuCard: Handmade flash card that is simple and affordable. It is a 1 MiB (8 Mib) flash device with a USB interface and software that allows you to switch regions and even eliminate the US region check code. Does not support any games larger than 8 Mib (Street Fighter II’ was the only commercial title that meets this criteria). Turbo Everdrive: Krizz is well-known for his flash cards. This new member to the Everdrive family can store multiple games on SD cards and even supports the Street Fighter II’ mapper. Features a bootable menu to select your game and a reset button on the cart for when you want to switch titles. A PC Engine or TurboGrafx-16 unit is one of the more expensive retro consoles, running $65 to $100. Getting a TurboGrafx-16 with TurboGrafx-CD and Super System 3.0 Card can be a pricy affair, and finding the TurboGrafx-CD can sometimes be a challenge. Cheaper, though still not exactly cheap, would be some variety of Duo or PC Engine with PC Engine CD ROM² and Japanese Super System 3.0 or Arcade Card. US TurboChip games are comparatively expensive, depending on the title. Most of the cheap games are the ones few people want. That said, there are some good titles that were produced in large enough numbers that the prices are still reasonable. Japanese HuCard games are significantly cheaper… in Japan. Prices get jacked up on eBay when the items are being sold internationally, and international shipping is usually expensive. The cheapest prices are on Amazon.co.jp, but there is no option for international shipping. If you have a contact in Japan who has the time and patience, however, this can be a great option to pick up some very reasonably priced titles. With the exception of some of the more in-demand titles, CD ROM² games of various stripes can be pretty affordable, with the US titles generally costing more than the JPN titles. The up side is that you can burn the truly rare and expensive titles from ISOs and play them on US or Japanese systems after you’ve emptied your bank account for the required hardware. As mentioned above, the Wii’s Virtual Console is the most affordable solution for playing many of the US TurboGrafx-16 games available through the service. For key titles like Military Madness it is the most affordable way to enjoy critical classics by far. Now that the Virtual Console has some CD and Super CD titles, there’s even more reason to look to theWii for your TurboGrafx-16 and PC Engine fix. I just happen to own a Turbo Express as well! I thought the NES was the first to have the multitap – four score. But I could be wrong. Where are you still seeing them? Great work marurun & racketboy! By the way, the post seems fine to me as far as the Is go, too. Do you know why the Wii is selling so many units? BECAUSE it plays Turbographic 16 games THATS why!!!! It’s interesting to see you mention Magic Engine, because it’s an awesome emulator, yet I could never get it to run Valis (actual disc, not a copy). I own Valis II, as well, which runs fine, but Valis tends to reset over and over again at the first screen that appears whenever the game boots up. Very annoying, because I’ve always wanted to play it. Did this system actually get released in the UK? They have the TG-16 games on the Euro Virtual Console, but I never remember it ever being released here, nor had I even heard of it until a couple years ago, and I remember all the systems that bombed in the 90’s..
Ahh…I somehow got Valis working in Magic Engine. Sweet game. It’s such an improvement over past Valis games. fastbilly1, according to the Wikipedia entry for multitap the PC Engine’s multitap was the first. The WP entry for the NES Four Score indicates it was released in 1990. I know the original PC Engine design has only one controller port, and you can bet they weren’t planning on releasing any 2-player games. I suspect a multitap was part of the original design manifesto. Still, the PC Engine Bomberman wasn’t released until 1990. I don’t know when the earliest 2PS game was released for the PC Engine, however. yeahhhhh. no. never worked for me… the Turbo Duo CD drive has got to be the cheapest piece of electronics on this face of the earth. Thank god for the Xbox – PC Engine emulator. My biggest pet peeves: short controller cord length and RUN+SELECT auto reset without confirmation! I’ll ALWAYS remember that one faithful day, 4AM, deep in some Neutopia II dungeon when I accidentally reset the game and I lost all progress (password based RPG)… man! But this is the system on which the Ys series really came alive so I’ll cherish it until my dying day! great read. one thing that would be cool would be a short list of must have games for the kids that don’t know the system that way they can pick them up when they are out on VC. there are tons more but that’s jsut the short list that came to mind. 1. excellent article, as usual…. I’ve found Mednafen to be a more solid emulator than Magic Engine, with its sole flaw in emulation (if you could even call it that) being that it doesn’t support improperly dumped ROMs (such as the byteswapped US HuCards that GoodPCE show as good; you’ll sometimes see people refer to these as “encrypted”). Other than that, the wickedly off-putting interface and somewhat high system requirements are the only reason I can see anyone avoiding it. The Xbox port of Mednafen is pretty snazzy other than I absolutely hate the forced adoption of the “perfect CUE” system, which I’m still not absolutely sold on. Perhaps if someone could explain precisely why CDRWin generates different TOC data than CDRDAO and why it’s somehow better, then I’d be more accepting of it. As it is, I can’t rip BIN/CUE images of any of my games and play them in Mednafen-X; I still have to stick to using the CDs or convert them to CUE/ISO/MP3 (which I absolutely hate doing). Ootake is pretty damn excellent as well, along with being frequently updated (weekly or sooner, generally), free, and highly compatible. It seems like whenever I do actually stumble on a problem with a game in Ootake, that same problem winds up getting fixed within the next release or two. Clazy. I will have to look into those! This article was linked to on the front page of gaming.ars. Nice work RB! I have to say that the TG16 is my hands down favorite console of that generation. I have spent more time on MednafenX than any other Xbox emulator, trying to get each of the CD games to work perfectly. It can be very finicky with CUE files! Also, as I’m sure many of you have already noticed, Underground Gamer is just a couple of games away from a “PERFECT” TG16/PCE (HuCard and CD) collection. Tipping the scales at well over 120GB, that is a very impressive accomplishment. I’ve used Mednafen for quite a while, but I’ve only briefly used it for it’s PCE/TG16 capabilities. But it does perform fine for those systems, as far as I’ve seen. I mainly use it for GBA games, as Mednafen is the only updating emulator of GBA, and it performs a bit better than VisualBoyAdvance for very high-requirement games (like Gunstar Super Heroes, lags like hell in VBA but Mednafen handles it fine). Although I only use Mednafen in Linux, as I can’t manage to build a binary for Mac OS X, and I’ve since abandoned Windows. And if you’re using Linux, Mednafen is really the only good option available, as MagicEngine has no Linux version or source code, so a Linux port will not be available any time soon.